Ejike Camillus Anthony, Ebenezer Mbaka (Rev. Fr. ) is a priest of the Catholic Church, ordained in the Catholic Diocese of Enugu. He is a resident priest at Our Lady’s Parish, Emene in Enugu State of Nigeria, and the founder and Spiritual Director of Adoration Ministries Enugu Nigeria (AMEN). Father Mbaka was born to the family of late Chief Humphrey Ogbuefi and Felicia Mbaka, both of Amata Ituku in Awgu Local Government Area of Enugu State. The Ogbuefi Mbaka family are known for having special talent in tapping palm wine in Ituku cmmunity. Fr. Mbaka is the only son of his parents. At his birth, Fr. Mbaka’s father, Pa Ogbuefi (deceased) heaved a sigh of relief that at last, he was blessed with a successor. 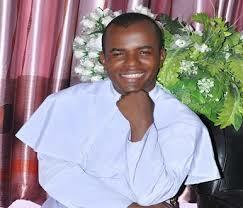 Right from the period he was an infant, Ejike Mbaka, finds time to commune with God. He assisted his mother in the kitchen and other domestic works, accompanies his father to his business of palm-wine tapping and ensuring that wines that were tapped were sold except the one reserved to take care of the family's daily visitors. A great philosopher, highly talented, creative, innovative and resourceful mind. A great thinker who can turn out new ideas from near impossible corners. An amiable soul-winner who knows those little things the people need to be happy and fulfilled. Hates discrimination in all its ramification. Relates with all irrespective of class, race, religion, colour etc. This is the man Rev. Fr. Ejike Camillius Anthony Ebenezer Mbaka.